Your brand will be the first thing to greet guests. Ideal environment for your sales team to meet industry decision makers. 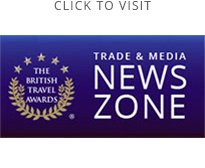 Linked sponsor’s logo in rolling credits panel on BTA website until 31st March 2020. Click/tap takes reader to Partners and Sponsor page where sponsor’s message and logo are displayed, together with link to sponsor’s selected website. Sponsor’s logo inclusion on venue display screens at scheduled times throughout the event. Sponsor’s logo displayed on multiple, one metre square stage LEDs during the sponsored item in the order of events. Sponsor’s logo and 150 words message included in the event programme. Rights to use sponsor supplied display, presentation material and prop in the sponsored area of the venue (subject to approval of the event management team). On-stage acknowledgement and brief promotional piece by celebrity presenter. The reception sponsor can offer a prize (minimum value £500) in the voter’s prize draw. They will receive the promotional benefits detailed in the voter’s prize draw within the package price.